This cowl-neck longsleeve is made with a comfy waffle-knit fabric that's been specially washed to make it extra soft. This is the softest thermal EVER and I live in it! Love the colors, the cut and the comfort. I originally bought a medium at a store, then ordered additional colors in small. It is roomy but what I consider a perfect fit for this top. Super comfy, easy relaxed fit. Goes well with jeans or joggers or leggings. My new fave! Over all comfy shirt. I would like it to be maybe a inch or two longer for both arms and body though. Very comfy and the turtleneck part is floppy so getting making up on the shirt isn’t a big issue. I have this in gray and had to come back for the black. This shirt is very comfy, and the black colour can actually be dressed up a bit with jeans and OTK boots. I would recommend! Originally I bought a Large (as I like my clothes to fit slightly looser), but found it way too big. The medium fit extremely well, while also providing a relax/slouchy fit. Going to buy all the colours! I love the fit, comfort and the style of this top. It is perfect for winter days at home it out with friends . Love my thermals!! I have both the black and grey one. So comfy and lightweight yet keeps me warm. Great buy! So comfy and cute! I’m for sure ordering another colour too! Love it! Comfy and cozy. This top is so cozy, comfortable, soft and actually really warm. It is slightly larger than I expected but it looks great, it doesn’t look sloppy. I love this sweater. I can wear it to work, going out for dinner or just hanging around the house. Super comfy and decently warm. Amazing sweater - great material, true to size and washes great. I am obsessed and will be ordering another colour. Great fit. I sized down from my regular small as it’s a bigger fit. Wish I picked up all sizes when they were on sale. I’ve had to stop myself from wearing this every day since I got it. Goes perfect with leggings and love the loose turtle neck. Super comfy but not frumpy. I usually wear small but purchased xxs and fits perfectly. Its exactly how I pictured it! Very comfy ! Love the fit, feel and overall look of the current thermal. Can’t wait to get my other colours..
Love this so much! Super comfortable and great with leggings or jeans. Will be ordering another colour. This top is cozy, comfy and stylish! You can wear with leggings or with jeans! Dress up or dress down! I loved it so much I purchased in another colour. Only downfall is hang to dry. Otherwise love it! Fits really nice an dis really warm, the cut works well with my outfits and the material isn't to thick. This top is so soft, I love it. It will be perfect for lazing around this winter. 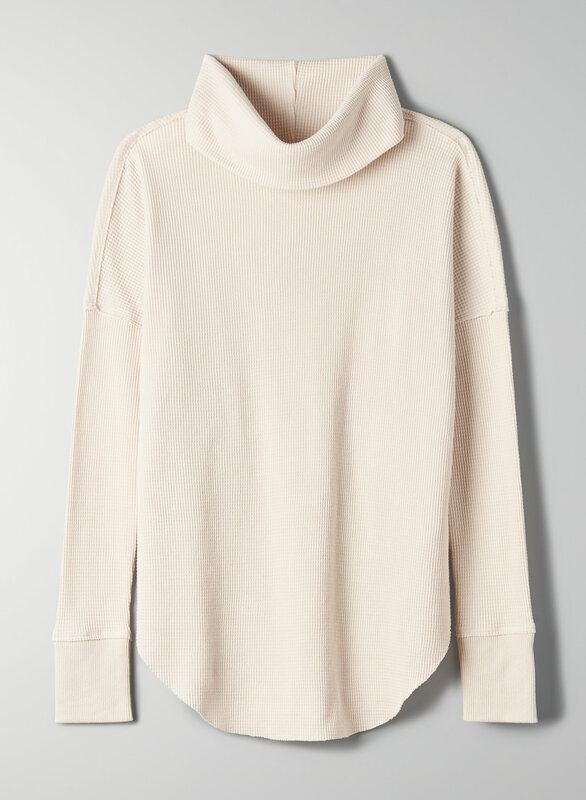 Really nice thermal, very soft, pretty thin (I hit the cream Color and anything other than beige underneath will show through) but still warm, and it’s the perfect oversized look I usually wear an XS and ordered the S, not too big, fits nice through sleeves and chest but still loose and a little oversized through the torso. Sleeves are long too! I’m 5’9 and the sleeves fit me really well. Would definitely recommend to a friend! Nice, very comfortable, I like it! Beat casual item to have.. goes every EVERYTHING!!! Super comfy, good fit. Love this thermal. This is fantastic for fall/winter. Great with a pair of leggings for the perfect casual look. I’m usually a small but I did order this in an XS and it fits perfect. I saw my co-worker wearing this and immediately ordered two (black and olive color). Love love love them. They are slightly oversize and completely comfortable. Wish I could afford one in every color! Cozy, good fit! I love the colour. I LOVE IT!!! Fave shirt. My winter go-to! Cute yet casual waffle with this seasons trend of a turtle neck! Good to our with leggings or dress up! Love it. Bought two more! I love this top. Very cozy, breathable and flattering. Goes with any type of pants. I have two. Love the relaxed style and the softness of this turtle neck….thinking about more colours for my wardrobe. It washes up well and keeps it’s shape!